Yesterday was a great day. I spent the day in the most beautiful place I’ve ever seen in my life and I now know where I will live later on in life. Auburn and I woke up early yesterday to take the train to a town about two hours (by train) away from Lyon. 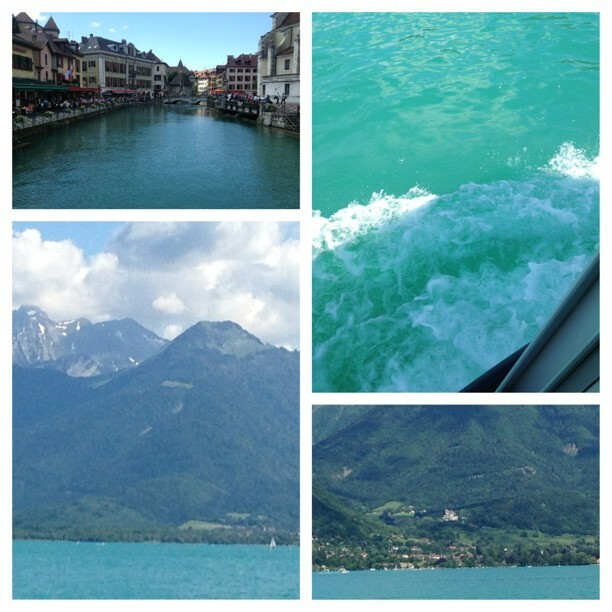 Once we got to Annecy, I fell in love. We ate lunch on the river that leads into the lake and I had a view of the mountains from my meal. It was breathtaking. The mountains, I might add, are a part of the Swiss Alps (.. I think) if that gives you an idea of how gorgeous this place was. But first, let’s start with what I tried at lunch. I’ve had a list this whole summer of things I’ve wanted to try while over here in France and thus far I’ve almost conquered my list and even added more to it. Yesterday I was able to check one more thing off of said list. That one thing was frog legs. Yup, I did it. Auburn ordered a plate of them and I ate the entirety of the one that she gave me. Not my favorite and it was completely shaped like the back half of a frog with the body intact even, but it also wasn’t completely horrible like other experiences that I’ve had while on this trip.. Ahem, pig’s feet.. steak tartare.. Anyway, after conquering frog legs, we headed to the lake to check it out. The water was the prettiest shade of blue that I’ve ever seen in my life, and then entire lake was this color. I was so amazed that I had to text one of my professors who is on the trip with us, and whose parents also live in Annecy, to ask if it was a real lake. Of course she replied that it is. I can’t express to you how beautiful this lake was. But wait, there’s more! Aubs and I find a boat tour to go on for an hour on the lake and I was so excited I couldn’t contain myself. She was getting annoyed. But she loves me so it’s okay. Finally, after waiting around for 45 minutes for the boat, we can get on. The tour starts and I’m in Heaven. I had a seat at the open window and I could feel the breeze on my face as we cut through the beautiful waves. The tour took us around the entire lake and during it we were able to see three castles. However, only one of them sticks out in my mind. This castle was Sleeping Beauty’s castle. Yeah, you heard me. Sleeping Beauty! Walt Disney modeled her castle after this one after seeing how magnificent it was. I believe it was built in the 11th Century, but don’t quote me on that. I do know, though, that the same family has lived in it for 27 generations, which is mindblowing. And awesome. The lake is surrounded by mountains and mountains and more mountains. So much room for hiking and boating and even paragliding. We saw like a million paragliders out yesterday. I kept begging Auburn to go there so that I could paraglide too, but that plan was a no go. The water was gorgeous, the mountains were beautiful, the town was adorable. Basically, I’ve found the perfect spot for when I can afford a castle of my own, which should be here in about seven years or so. Not too long.